Bank from almost anywhere with the Chase Mobile® app. 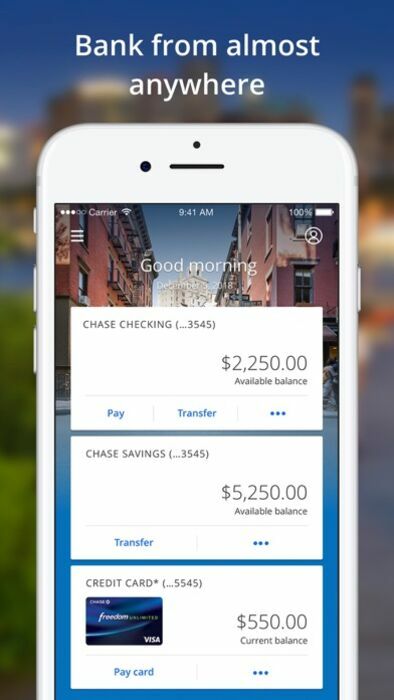 Manage your accounts, pay bills, pay people, deposit checks, even transfer money. And do it all safely and securely with your device. [+] View your account balance at Sign in using Account Preview. [+] Monitor your checking, savings or credit card activities. [+] Set up travel notifications for your debit and credit cards. [+] Set up Account Alerts and adjust your preferences. 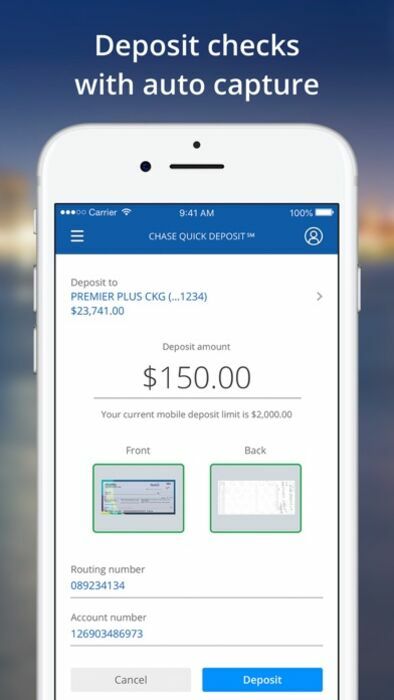 [+] Use Chase QuickDeposit® to deposit a check just by taking a photo. [+] Check and get updates on your credit score. 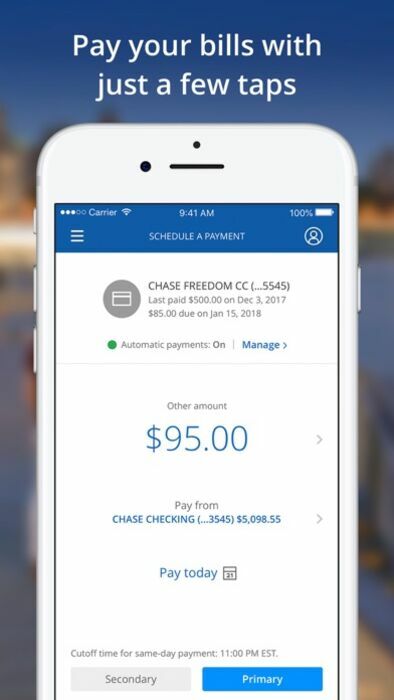 [+] Schedule, edit or cancel payments for your Chase credit card and your other bills. 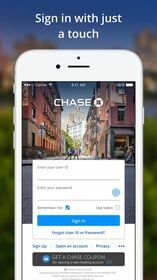 [+] Transfer money between your Chase accounts. [+] Reload your Chase Liquid® prepaid card. 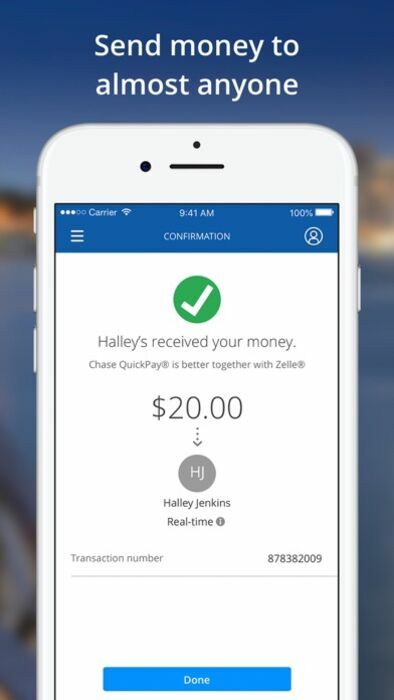 [+] Track and redeem your rewards with Chase Ultimate Rewards®. [+] Send friends and family a digital gift card. [+] Earn statement credit by using Chase Offers with your eligible credit and debit cards. [+] Grow your savings automatically with Autosave. [+] Trade stocks, bonds, mutual funds and exchange-traded funds (ETFs) with a You Invest℠ by JPMorgan Trade account. [+] Find the nearest Chase branches and ATMs. [+] Speak with a service representative 24/7. [+] Some features are available for eligible customers and accounts only. Any time you review your balance, keep in mind it may not reflect all transactions including recent debit card transactions or checks you have written. A qualifying Chase transfer account is required to transfer funds via text. [+] There is no charge from Chase, but message and data rates may apply. Such charges include those from your communications service provider. Delivery of alerts may be delayed for various reasons, including service outages affecting your phone, wireless or internet provider; technology failures; and system capacity limitations. [+] Face ID, iPhone, iPad and Touch ID are registered trademarks of Apple, Inc.
• Enjoy a more organized list of all of your profile and settings. • Access statement summaries from Credit Card transaction activity. • Freedom cardmembers can now activate their 5% quarterly cash back. • United cardmembers can now view their rewards balance. • Grow your savings automatically with Autosave.